Saturday, the second day of competition, started bright and early with the 3,000m events. A Owolabi-Fajana (of 288 Track Club) took the 11 year old age category win with a time of 11:35.02 as Pierce Parker (of Velocity Track Club New York) also secured his age category win with a time of 11:09.77. For the 12 year old's Payton Drumwright (of Mallery Challengers) took the age group win with a time of 11:10.70 and Griffin Lupes (of Firebirds Track Club) took his age category victory with a time of 11:17.19. Anna Graves (of Knoxville Youth Athletics) dominated her race and clocked a 10:43.39 to grab the 13 year old age category victory and after that, Keegan Smith (also of Knoxville Youth Athletics) grabbed his 13 year old title as well as a new meet record with a time of 9:44.44. Knoxville must be doing something right! 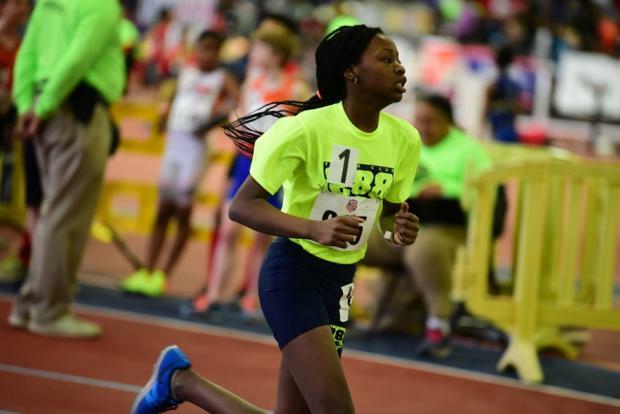 Jessica Secor doubled back from her 1500m win yesterday to win the 14 year old category again with a time of 10:33.16 as Ashton Tolson (Baltimore City Track & Field Club) took the male title with a time of 10:11.24. Jumping to the 15/16 year old wins, Alli Crytser took the title with a time of 10:48.06 and Kahzi Sealey (of the Bermuda Pacers Track Club) also took his age group title with a time of 9:44.46. 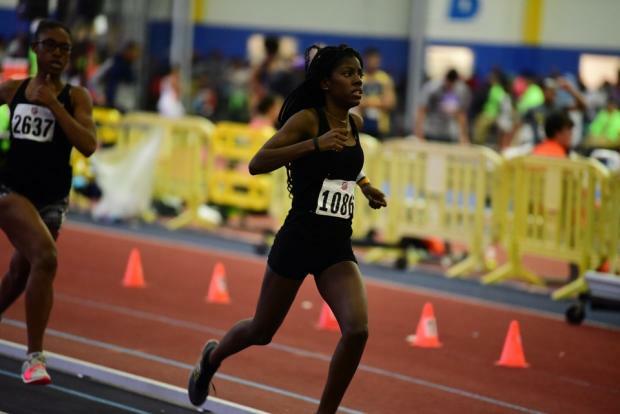 Kiera Cleveland, of the 757 Colts Track & Field team, took the 17/18 age group win with a time of 12:11.82 and Aaron Modrow doubled back on his 1500m win to secure the 3K title as well with a time of 9:11.82 which broke the record by around 11 seconds. Tamika Brown also doubled back on her 1,500m win the day before and came back with a strong 12:39.03 to win the female master's 3K as Dietrich Rush did the same with a 12:03.19. Afterwards came the 200m dash finals (semi-finals were on Friday) and the 5&6 year olds hopped onto the track first. Elise Pridgeon ran a 34.88 to grab the title and Amir Joseph of Glenarden TC ran a 34.25 to secure the boys' 200m title. 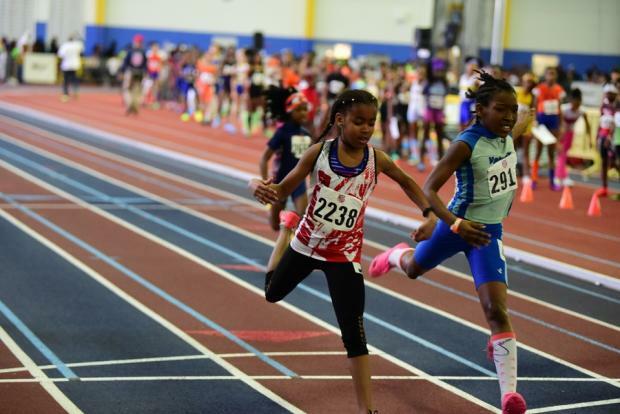 For the 7&8 year old age group, Alaiyah Choice of Legion Of Zoom Track Club grabbed the national title and a new meet record with a time of 31.21 as her counterpart Dashau Morris II did the same with a 29.91. 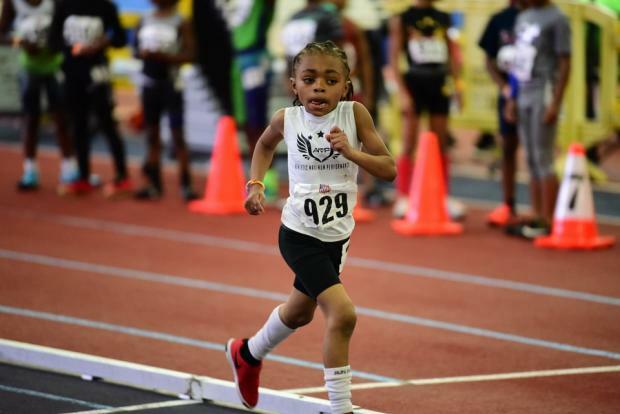 Akeelah Scott from Team 4mula Sports earned her 9 year old 200m win with a time of 30.53 as Chande Cross III (Virginia Golden Army) won his race with a time of 28.41. 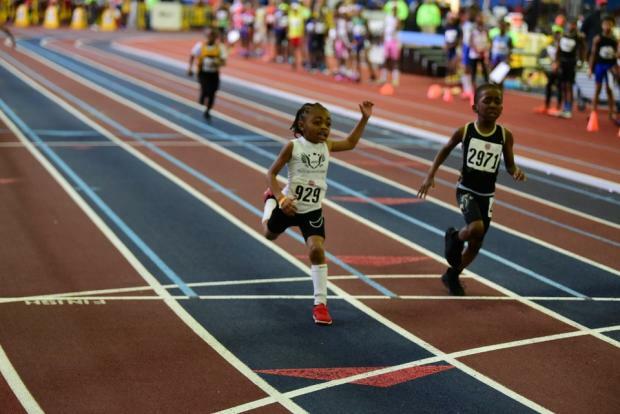 The 10 year old 200m heats were on fire with Zion Bullard (Lane 4 Track Club) winning the girls' title in 27.39 and James Patterson (Lexington Wildcats) winning the boys' title in a 27.84. Londyn Atkinson of Track Xplosion Club won her 11 year old championship title with a time of 27.36 as Abaas Hunter (of Delco Stallions) won his event with a time of 26.56. 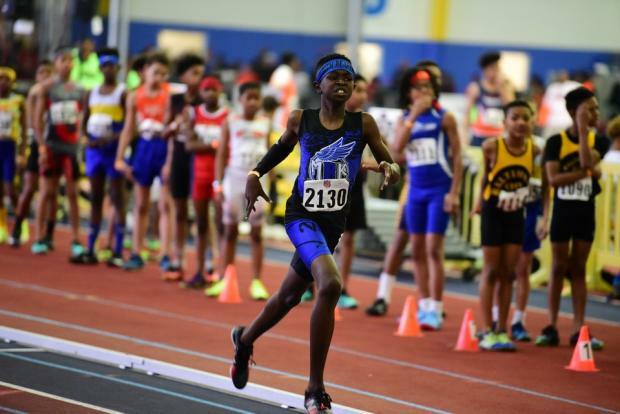 For the 12 year old's Payton Payne (of Glenarden Track Club) won her title and a new meet record with a hard-fought time of 25.62 and Christian Walker of the Metro Eagles Track and Field Club won his race with a time of 25.79. Kayleigh Stargell (Full Throttle Elite) threw down a 26.30 to win the 13 year old category and Malachi James (CL Athletics Stars Track Club) clocked in at a 23.83 to win his title. 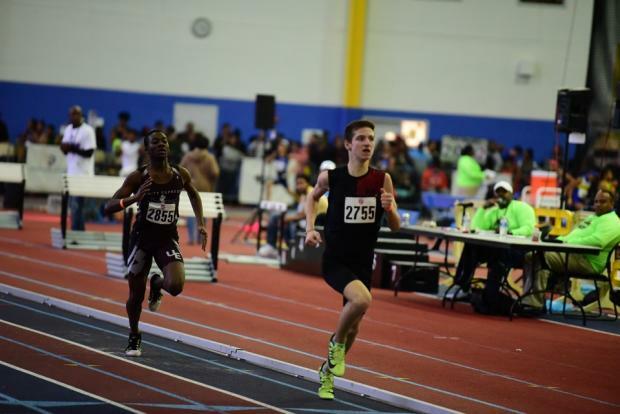 The 14 year old's age group had Madison Jeffries (No Speed Limit) and Charles Wall-Davis (VA Trailblazers) as its victors with times of 25.75 and 23.65. 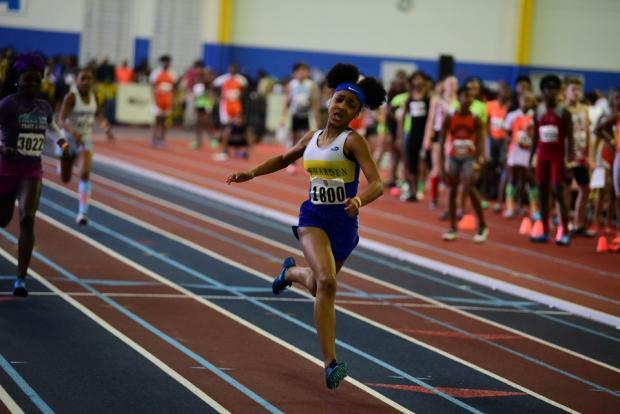 Caitlyn Bobb from the Bermuda Pacers Track Club ran a 25.40 to claim the 15/16 age group title and Terrell Robinson Jr was .07sec off of a sub-23 200m but still blazed through the PG County facility to claim the 200m title for the 15/16 boys. Jade Sabir and her twin Jada (both of PeoplesChoice) grabbed a 1-2 finish in the 200m with Jade clocking a 25.34 to win the title, but both had incredible races! Emmanuel Ajiroba of the Flying Angels track club grabbed a sub-23 race (22.67) and won his 17/18 age group event. For the Masters, Latoya Whitted from Track Xplosion won her event with a 29.98 and Jerome Holder from Above Xpectations Track Club took the title with a 24.18. Javonta Smith, of Port City Track Club, took the men's open title with a time of 22.67 (another sub-23!). Next up on the track was the 800m race and it started with the 5-6 age division. Chloe Franklin (of the Michigan Mustangs Track Club) took the title with a time of 3:25.34 while Ashton Clements of Amp Elite Platinum club took the 5&6 boys title with a time of 3:18.09. For the 7-8 age division, Leah Franklin (also of the Michigan Mustangs Track Club) ran a 2:59.80 to win her event while Maurice Pope III (also of the Amp Elite Platinum club) ran a 2:49.39 to win the boys' title. 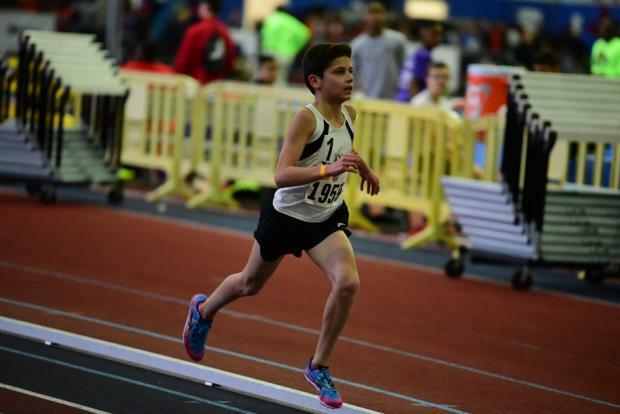 Madelyn Ramirez (Ashburn Elite Track Club) ran a 2:42.78 and Mekhi Sharper (Delco Stallions TC) ran a 2:41.61, both snagging championship titles for the 9 year old 800m race. 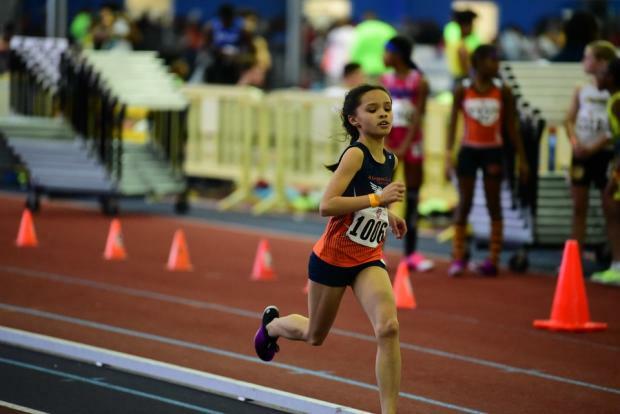 For the 10 year olds, Kylie Comas of the New York Novas TC ran a 2:42.57 and won her event while Grant Reynolds of the Mark Trail Flying Eagles team ran 2:28.89 to win his 800m title. Damira Allen, in her orange Chester Cheetahs singlet, ran a 2:25.12 to win the 11 year old 800m title and Elijah Price from the My Brother's Keeper team ran 2:28.01 to win on the boys' side. The 12 year olds dropped some speedy times with the winners being Cortney Adams of the Charles County Elite team (2:28.61) and Jaylen Bennett (2:20.38). 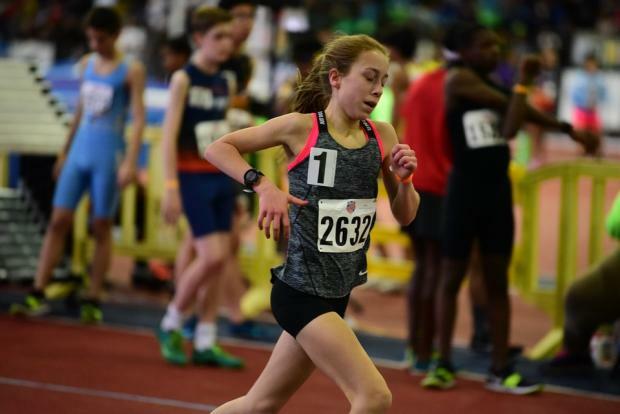 Jordan Bray won her 13 year old 800m title with a time of 2:26.28 as Ladanian Mcgrath (Camden Clock Chasers) won his age group with a blazing time of 2:15.60. The 14 year old's also saw some fast heats with Anissa Moore winning the title with a time of 2:23.71 and Tyler Dailey winning with a 2:06.55, also a new meet record. Maddie Denny crossed the line in a 2:28.74 which had her as the victor for the 15/16 800m age group and Nirob Smith-Mills (of the Bermuda Pacers Track Club) ran a 2:05.17 which also put him in the lead and won him the title. 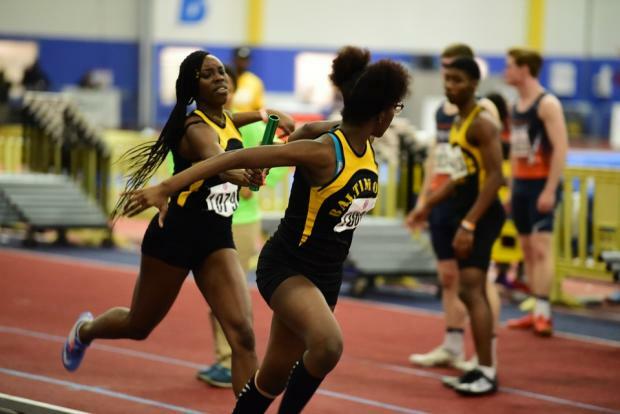 For the 17/18 year old category, Nia Warren and Jordan Carrington (both from Baltimore City Track & Field club) ran a 2:25.87 and a 2:02.47 to each claim a 800m age group title. In the open race Keegan Cochrane clocked a 2:02.68 to win his event and in the masters, Tamika Brown of Port City Track Club and Jason Smith each one titles with times of 2:48.61 and 2:50.80. After the excitement from the fast-paced 800m heats, the hurdles were set up for the 60m hurdles semi-finals and then cleared off for the 60m dash semi-finals. Both of the finals for these events took place the next day. Finally, the relay teams gathered together to take part and race in the 4x400m relay. 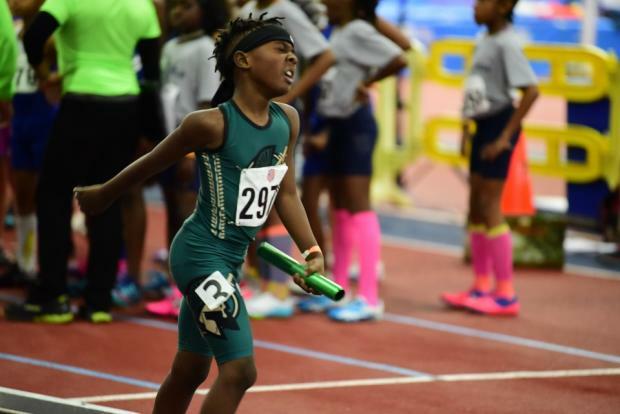 The Chester Cheetahs Track Club took the title in the 7&8 year old girls relay (5:46.32) while the Virginia Golden Army squad took first in the 7&8 year old boys relay (5:33.50) and they also won the 10 year old boys relay (4:48.81). The 10 year old girls' 4x400m was dominated by the Glenarden TC team who clocked a 4:55.87. The 12 year old girls' 4x400m was won by the New York Novas Track Club girls with a time of 4:24.81 which is also a new meet record. The 14 year old girls' relay race was won by the Flying Angels team in a 4:12.61 and they also won the boys 15&16 4x400m with a time of 3:46.21 (a new meet record). The boys 14 year old 4x400m was won by the Metro Eagles team who clocked a 3:43.74. 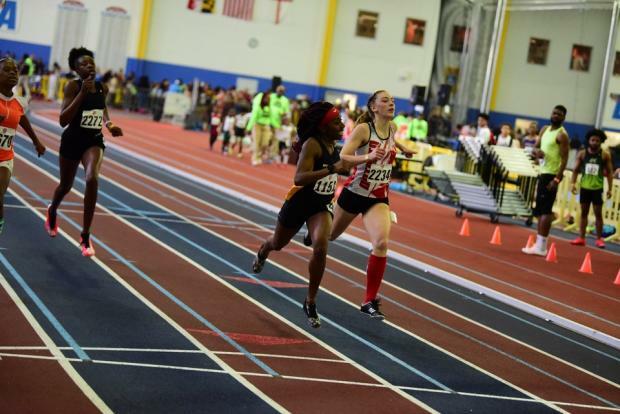 Baltimore City TC dominated the 17&18 events with their girls team running a 4:08.21 and their boys team finishing at a 3:28.88 (new record).